The Andaman green pigeon (Treron chloropterus) belongs to the family of doves and pigeons, the Columbidae. 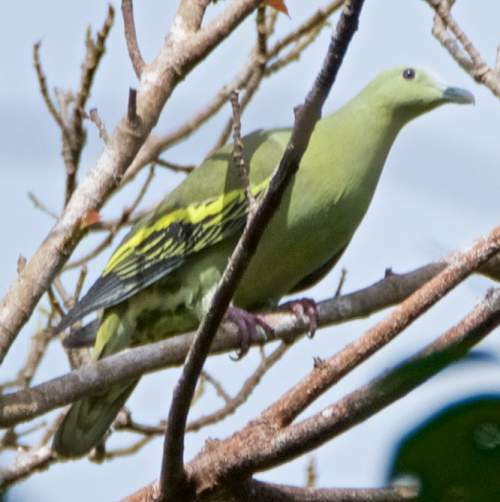 This green pigeon species is distributed in Andaman and Nicobar Islands, India. These pigeon species are listed as 'Near Threatened' by IUCN. These pigeons are monotypic species. The Andaman green pigeon (Treron chloropterus) is a medium-sized green pigeon, measuring 25 to 30 cm in length. The overall plumage of these pigeon species is greenish. The forehead is whitish and the crown is pale grayish blue. The rump is bright greenish yellow. The males have a small maroon mantle patch. The underparts are greenish. The wings are long and green. The flight feathers have yellow edge and there is a yellow bar across the coverts. The undertail coverts are whitish. The undertail appear graduated. The thick bill is pale bluish gray and the tip of the upper mandible is curved. The irises are grayish blue. The legs and feet are red. The call of these pigeon species is a series of pleasant, low-pitched, whistling sounds. These pigeons are distributed in Andaman and Nicobar islands of India. Vagrant birds have been observed in Coco Islands of Myanmar. They are present in north, middle and south Andaman Islands as well as Great and Little Nicobar Islands. These Andaman green pigeon species have high forest dependence. They normally occur in altitudes from 0 to 1500 meters. The natural ecosystems and habitats of these species include, tropical and subtropical moist lowland forests, evergreen forests and forest edges. The diet of this Andaman green pigeon consists mainly of fruits. Berries, fruits, figs and seeds of fruiting trees are their primary food. The breeding season of these Andaman green pigeon species is during February and March. Fragile nests made of sticks and twigs have been observed six meters above the ground. These birds are monogamous. The clutch contains two white eggs. These pigeon species are non-migrant resident birds. They disperse locally after breeding. The populations in higher altitudes descend to the lower levels in winter. Post breeding, the juveniles may disperse and establish in new locations within the range. Within their range they may make local movements for feeding and breeding. The global population size of the Andaman green pigeon (Treron chloropterus) is estimated to number 2500 to 10000 individual birds. The overall population trend of the species is considered to be declining. In most of its range, this pigeon species is reported to be uncommon to common. The generation length is 4.2 years. Its distribution size is about 74,700 sq.km. Habitat alteration and destruction, deforestation, logging, agricultural expansion and human disturbances are the main threats that are endangering the survival of these pigeon species. The Andaman green pigeon (Treron chloropterus) is approaching the thresholds for being Vulnerable, under the range size criterion, under the population trend criterion and under the population size criterion. The CITES (Convention on International Trade in Endangered Species of Wild Fauna and Flora) status is ‘Not Evaluated’ for the Andaman green pigeon (Treron chloropterus). The Andaman green pigeon (Treron chloropterus) is closely related to species Treron affinis, Treron phayrei and Treron pompadora. The Andaman green pigeon was earlier considered conspecific with Treron pompadora. 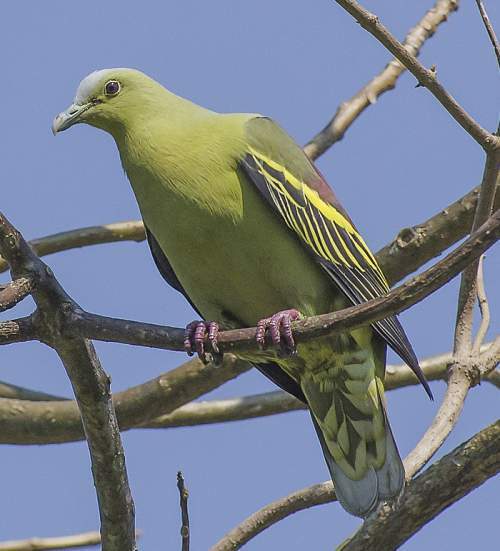 Current topic in Birds of India: Andaman green pigeon - Treron chloropterus.